No need for celebration, Mr. 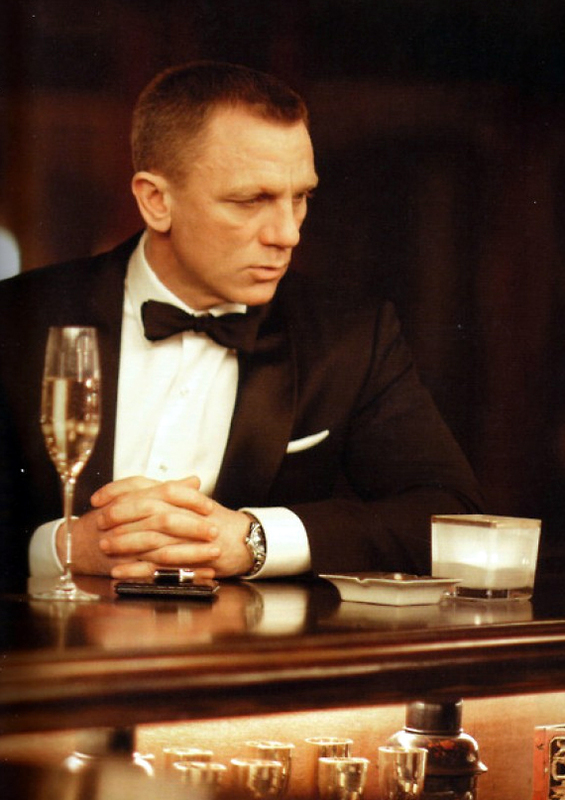 Bond always enjoys a chilled glass Bollinger. If you’re interested in living like a WASP, then it is essential that you know how to party like a WASP. And whether you’re living it up urban style on the Upper East Side, or relaxing in the Connecticut countryside, no WASP party would be complete without a generous helping of the bubbly. Or in other words, that most cheerful of all wines, Champagne. Champagne has a lot going for it. It’s versatile, it’s one of the best quality wines on the planet, and it’s virtually synonymous with fun and celebration. Oh yes, did I also mention that it’s James Bond’s drink of choice? Sure everything knows about the dry vodka martini (shaken, not stirred), but read Bond’s first adventure in Casino Royal and you’ll see him reaching for a flute far more often than a martini glass. Bond and the the obvious WASP cred aside, Champagne (and better sparkling wine) really does up the enjoyment factor of nearly any occasion. So do yourself a favor; pitch that bottle of André and read on to learn how to select, drink, and enjoy a magnum of the good stuff like a pro. A common misconception is that Champagne was invented by a Benedictine Monk by the name of Dom Pérignon during his stint as cellar master at the Abbey of Hautvillers in the later half of the 17th century. In truth sparkling wine had been produced over a century earlier by monks at the Abbey of Saint-Hilaire in Limoux (Saint Hilaire sparkling wine is still available on the market today for a bargain price of $12 a bottle). None the less, Dom Pérignon was instrumental (certainly more than any other individual) in the development and perfection of what we know as Champagne today. Perhaps his greatest contribution was refining the process of in-bottle fermentation to produce carbonation in wine, however that’s far from his only achievement. For example, he was among the first to blend base wines to develop certain characteristics in his finished sparking wines. He was one of the pioneers of making white wine from red grapes, a process still common today. He was also the first to use a cork stopper for Champagne bottles and a leader in recognizing the benefits of cellar aging. 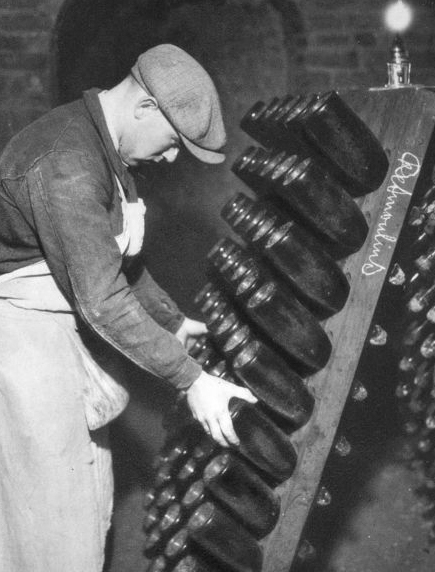 A worker attending to bottles undergoing secondary, in-bottle, fermentation during the Méthode Champenoise. However, what really set things in motion was the perfection of the Méthode Champenoise, or Champagne Method (sometimes known as the Traditional Method) of sparkling wine production in the 19th century. This is the method that all Champagne, and better sparkling wines, still practice to this day. Without getting too in depth, it involves the creation of a blended base wine, which is then given a does of sugar and yeast, and fermented a second time in a sealed bottle to produce the carbonation that makes sparkling wine sparkle. The Champagne method of production, combined with the ideal climate and soil of the Champagne region, quickly lead to the explosive growth and popularity of the sparkling wine from Champagne (known by then simply as Champagne) among Europeans and the British during the 18th and 19th centuries. Over the first half of the 19th century alone, Champagne production increased from 300,000 bottles to over 20 million bottles. From that point on, the world never looked back. Today there are thousands of producers, making making millions of cases, of sparking wine in the traditional method, yet Champagne remains the benchmark by which all others are judged, and often fail. While Champagne can seem overly complicated, it’s really not so long as you understand a few basics notions. The first, and most important, distinction that you must know is that while all Champagne is sparkling wine, not all sparkling wine is Champagne. The use of the word Champagne is reserved by EU law for only those sparkling wines produced by the traditional method and in the Champagne region of France. Other, sometimes very good, sparkling wines are made in the traditional method throughout France (labeled as Cremant), Europe, and the rest of the world, but true Champagne only comes from Champagne. 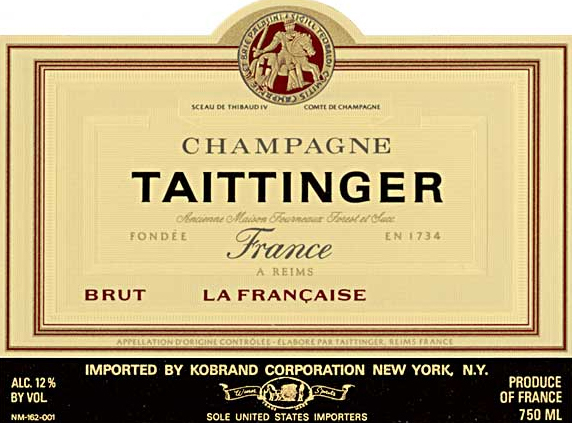 A typical Champagne label. Note the use of the word Champagne and the “Product of France” at the bottom. That’s how you know it’s the real deal. Outside the EU some producers will still use the term Champagne (ex. California Champagne) on their labels, but with increased globalization, that’s becoming rarer and rarer. Most better producers will gladly self identify as sparkling wine rather than attempt to free ride off the famous name. If you’re ever unsure, always look for “Product of France” on the label to know you’re getting the real deal. Brut: Typically dry to very dry (that is to say, not sweet) and the most common type of Champagne (and sparkling wine) available. This is also the most versatile type of Champagne, but one thing it is not suited for is dessert. Extra Sec (Extra Dry): Here’s where it gets a little confusing because extra dry actually means “not very dry” or “slightly sweet”. This is a popular, easy drinking variety of Champagne that’s still fairly versatile in terms of pairings. However it’s still not up the challenge of dessert. Demi-Sec (Medium Dry): These are less common and represent the sweetest Champagne you’re likely to find in stores (there’s a Doux, or “very sweet”, version as well, but it’s difficult to find). These can be quite good depending on your taste and is the only Champagne up to the task of tackling a sweet dessert. Non Vintage: The most common type of Champagne available, this is the standard offering released every year by the producers. It’s blended from a mix of current and past vintage wines with the goal of recreating an identifiable house style (more on that later) from year to year. As such it will not have any sort of vintage date on the label. It’s typically aged between 1.5 and 2 years prior to release. Non-Vintage (N.V.) Champagnes usually sell in the $20-$50 depending on quality and the producer. A bottle of Louis Roederer’s Prestige Cuvee Cristal. Note the vintage year. Vintage: These are sparkling wines created with the wine of a single (usually) good year, or vintage. Typically they’re made with better grapes, from better vineyards, and aged longer, anywhere between 2 and 5 years. The result is usually a much more complex and concentrated wine. Look for the vintage date on the label and expect to pay a little more over the N.V. price for that added quality, normally in the $60-$100 range. Prestige Cuvée: These are the top of the range offerings from the best producers. Like the Vintage variety, they’re produced from wines of a single vintage and only during exceptionally good year. They’re made with only the best grapes from the most prestigious vineyards and are typically aged for 5-8 years prior to release. You won’t find Prestige Cuvée on the label, so you’ll have to identify these beauties by the vintage date, the price tag ($100-$500 at release), and by their trademark names such as Louis Roederer’s Cristal, Moët & Chandon’s Dom Pérignon, or Veuve Clicquot’s La Grande Dame. While expensive, these really do represent the finest, richest, and most concentrated sparkling wines on earth. Aside from those general categories, one other item to look for are the words Premier Cru or Grand Cru on the label. These are indications that the grapes used for the wine were sourced from a select group of specially designated vineyards (Grand Cru being the highest honor) in Champagne and is usually a good indicator of quality. Prestige Cuvée wines for example will likely be sourced from nothing but Grand Cru vineyards. However, it is possible to find Premier Cru or even Grand Cru Champagnes from smaller grower/producers at very reasonable prices. A Grand Cru vineyard in Champagne. This provides the raw materials for the best sparkling wine on the planet. Light and Elegant: This style is characterized by a pronounced acidity or tartness and dominant flavors of citrus fruit. Generally made from mostly white grapes, such as Chardonnay, they are the lightest bodied, crispest, and most refreshing Champagnes available. Typical producers are: Mumm, Perrier-Jouët, Piper-Heidsieck, and Tattinger. Medium Bodied: Like the name implies, these are the middle ground Champagnes with respect to body and flavor. They’re usually made with more red grapes, such as Pinot Noir, and as a result offer more red berry and biscuity flavors along with the citrus. Well known producers are: Moët & Chandon and Pol Roger. Full Bodied: These are typically the more intense and concentrated with less acidity. They’re made with a higher proportion of red grapes and feature full flavors of berries and toasted bread. 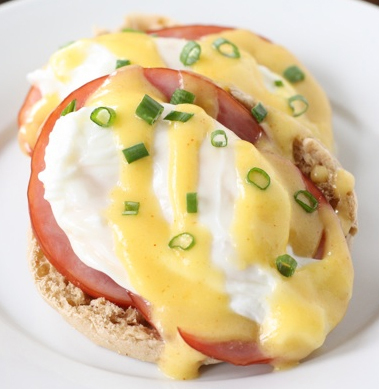 They can also have an almost creamy style texture that’s just wonderful. Typical producers are: Bollinger, Krug, Veuve Cliquot, and Louis Roederer. There is really no difference in quality between styles (at the same level at least) and what you like comes down to a matter of personal taste and perhaps occasion. The only way to find out your own preferred style is to try them all! Champagne and caviar are a classic pairing, but the wine is equally at home with anything oily or salty. That’s a shame because Champagne (and sparkling win in general) is perhaps the most versatile wine you can buy. Between all the different styles and products available, there’s literally a sparkling wine to go with any occasion. As an appetizer and with dinner Brut Champagne goes with just about anything, but is happiest when paired with salty and oily foods. That means you can very properly enjoy a glass of Champagne with anything from a plate of caviar, to peanuts, to french fries and fried chicken. When it’s time for dinner you may want to opt for a fuller bodied style, which will go with just about anything you like, but especially so with seafood or pasta dishes. One of my favorite pairings is Champagne with spicy Asian cuisine, which works exceptionally well. The only real exception is to stay away from tomato based sauces, which can clash with the wine. Nobody is perfect. 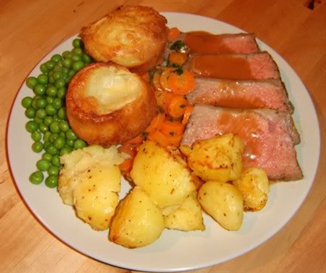 For dessert make sure to put away the Brut and break out the Demi-Sec Champagne to accompany sweeter dishes. It will go best with lighter colored desserts such as lemon dishes, fruit, and custard, however no one will arrest you for enjoying some with a piece of chocolate cake either. And finally, why confine your drinking to the evening? 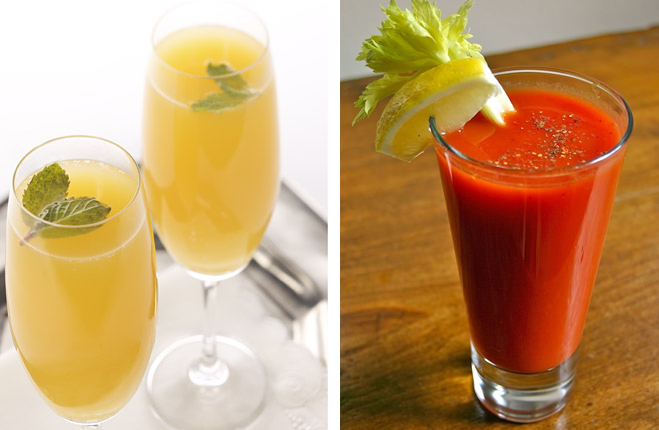 Champagne is equally at home in the morning, especially during brunch. 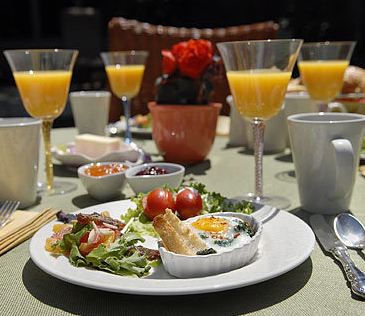 Early in the day pair it with egg and mushroom dishes for a real treat, or mix it two parts to one with orange juice for that other brunch classic, the Mimosa. The general rule is that you’ll want to serve sparkling wine cold, around 40 degrees. Better Champagnes can be served slightly warmer, but I would never go north of 50 degrees. Just make sure never to leave the bottle in the fridge for long periods of time since it can pick up off odors and/or be disturbed by the fridge motor as it cycles on and off. Rather, keep Champagne with your other wines and chill it in the fridge for a few hours before drinking. When it comes time to open the bottle, don’t be intimidated. Make sure it’s properly chilled (to reduce pressure) and remove the foil and wire enclosure from around the cork. Place a dish towel over the cork, get a firm grip on the towel, and slowly rotate it (and the cork) back and fourth while holding the bottle steady and pointed away from anything, or anyone, you don’t want damaged. When you feel the cork begin to rise, apply slight downward pressure to hold it back as you continue twisting so it eases out as slowly as possible. While a loud “POP” is dramatic and fun, what you’re really after is a slight “sigh” to release the pressure as slowly as possible. 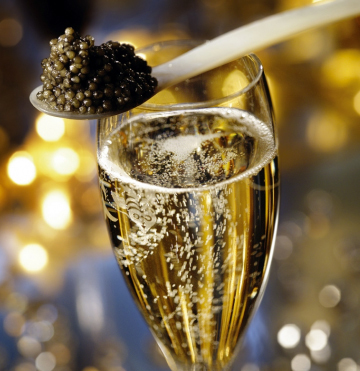 A simple flue is the perfect way to enjoy the magic in every glass of Champagne. As for stemware, you can drink Champagne out of anything, but the classic flute or tulip glass is what you really want. These tall, narrow glasses are specifically designed to retain carbonation in the wine while letting you enjoy the bubbles as they move up through the glass. The long stem also insulates from body heat, helping to keep your wine cool longer. You’ll want to avoid the classic bowl shaped Champagne glasses as they allow all those bubbles and aroma you paid so much for escape far too quickly. Lastly a word on aging. All Champagnes claim to be ready to drink upon release, but that doesn’t mean they’ll be at their best. Prestige cuvées reach their peak 10-15 years after release and will keep for decades after. Even basic NV Champagne will benefit from a few years in cool, dark place. However, do not attempt to age your Champagne if you can’t offer it the right conditions (50-60 degrees) for a long time. If you’re plan it to age it on a wine rack in the kitchen, then it will never be better than now! Don’t age wine if you can’t provide the right conditions! This is ideal, but a simple home wine fridge will do the trick. First, if you don’t already have them, go out and get yourself some proper glasses. No need for the ultra expensive crystal set of 12, a simple set of glass flutes or tulips will do just fine. Next is to try some Champagne! 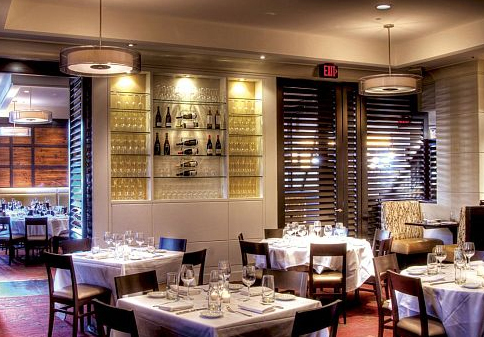 One option is to try out a wine bar where you can experience as glass at a time. The downside is that most wine bars are often lacking on sparkling options, and when they do have Champagne, they won’t offer it by the glass. The other option is to grab a bottle from your local retailer. Start with a basic NV Brut and work your way up from there. Want to get a sense of Champagne without breaking the bank? As mentioned earlier, many producers make very fine sparking wines using the Champagne method all over the world. Just look for “Traditional/Champagne Method” or “In-Bottle 2nd Fermentation” on the label. As mentioned earlier, anything labeled Cremant is French sparking wine made in the classic method outside of Champagne and most of what is imported drinks well and is a great value. My favorites are the American versions produced by the Champagne houses themselves. The best in my opinion are Domaine Chandon (Moët & Chandon), Mumm Napa (Mumm), Domaine Carneros (Tattinger), and my personal favorite Roederer Estate (Louis Roederer). All are very good, give you a great taste Champagne style, and cost about half as much ($15-$30) as their French cousins. For a real deal there’s nothing better than Cava, the Spanish interpretation of Champagne. Cava is produced in the Traditional Method and can be easily be found for under $10 a bottle. Learn more and become an expert. This article covers only the bare basics and there’s a lot more information for those willing to seek it out. A great place to start is French Wine for Dummies which devotes and entire chapter to Champagne. Good luck and keep those bubbles flowing! Few things scream WASP like a glass of good single-malt scotch. In the pantheon of WASP culture, few treasures are as coveted and revered as a bottle of good Single Malt Scotch Whiskey. Scotch has always enjoyed a certain amount of mystique. It’s the drink that everyone knows, few dare to try, and fewer still know anything about. It’s also possibly the strongest (both literally and figuratively) “statement” drink out there today, in that scotch has the ability to project that WASP’y image like no other. Don’t believe me? Order a glass of next time you’re out to dinner with friends and see what happens for yourself. But wait, not so fast! There are a few things you should know before hitting the bar. Like most things WASP’y, scotch can be a somewhat complicated and confusing subject. It’s also important to concede right off the bat that scotch does has a few things going against it. 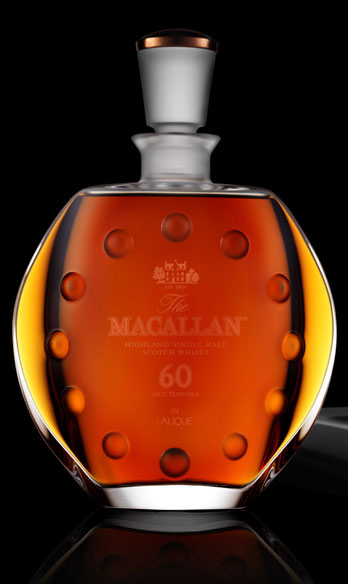 This bottle of Macallan 60 year old scotch costs as much as a midsize family sedan. It’s expensive – or rather, it can be expensive. In reality scotch prices run the gamut from less than $10 to more than $10,000 a bottle and, like most things in life, you get what you pay for. In other words, you’ll want to avoid the really cheap stuff. A typical “good” bottle of Scotch will usually range anywhere from $30 – $100 depending on the age and producer. While that’s not inexpensive, it’s not outrageous either considering the amount of time and effort that went into creating it and that contents won’t go bad after opening (like wine). What makes a good scotch? Well, keep reading and find out! No one knows for sure when the Scots first started making whiskey, but it is known that the ancient Celts produced distilled spirits, which eventually evolved into the scotch whiskey we know today. The first recorded example of distillation in Scotland is attributed to Christian monks during the 11th Century A.D. However, scotch whiskey didn’t hit the big time until the 19th Century. It was then that reductions in whiskey taxes, the advent of new distillation technology, and the outbreak of the phylloxera epidemic (which destroyed European wine production) combined to push scotch to the forefront of the British drinking scene. It’s remained a favorite and a classic ever since. Many modern day distilleries have been operating since the 19th Century. Scotch whiskey is essentially like every other whiskey in the world, in that it’s a spirit distilled from cereal grains, and subsequently mellowed through aging in wood casks. What makes scotch unique is the type of grain used (barley), the manufacturing process, and of course the fact that it can only be made only in Scotland. Today scotch falls into one of two major categories: Blended and Single Malt. Blended Scotch Whiskey: The vast majority (more than 90%) of scotch available in the US today falls into this category. Essentially blended scotch is exactly what it sounds like, a product that’s created by blending various other whiskeys (sometimes as many as 50 or more) together. The idea is to create a softer style of whiskey that appeals to a wide audience. Similar to the great Champagne houses of France, each blended scotch producer of has a certain “house style” that they’re known for. One of the primary differences between a single malt scotch and a blended scotch in terms of quality (and cost) is that in addition to pure malt whiskey, the latter may incorporate cheaper grain whiskey (mass produced from corn) into the blend. In fact the typical ratio for blended scotch consists of 60% grain to only 40% malt. The higher the proportion of malt whiskey in the blend, the higher quality (and more expensive) a given scotch will be. 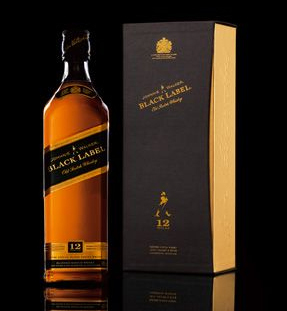 Johnnie Walker is one of the most famous brands of blended scotch. The Black Label version is aged 12 years and comparable to a quality single malt. Another determination of quality is the age of the blend. Normally most whiskeys used in the blend are aged about 5 years. However, some higher quality blended scotches will use whiskeys that have been aged longer, sometimes much longer. For example, if you see a bottle of blended scotch labeled as 12 year, that tells you that every whiskey in the blend (both grain and malt) has been aged for at least 12 years. One common misconception when it comes to blended Scotch is that they’re inferior to single malts. While that’s often true, remember that a high quality blended scotch can actually be much better than a cheap single malt. Single Malt Scotch Whiskey: Now we’re getting into the real WASP territory. No other drink conjures images of the WASP lifestyle like a glass of fine single malt scotch. But what’s all the fuss about? Well, lets find out! The actual process of making malt whiskey is both expensive and labor intensive. It begins with the grain (in this case specially selected barely), which is subsequently malted. Malting means that the barely has been soaked in water to the point of germination, or when it’s just beginning to sprout. The malted barely is then dried in kilns fired by peat and coal. The use of peat during the drying process is one of the unique aspects of Scotch whiskey and it imparts a distinctive smokey flavor and aroma to the finished product. Next, the dried malted barely is mixed into warm water to create a mash and yeast is added to begin the fermentation process. 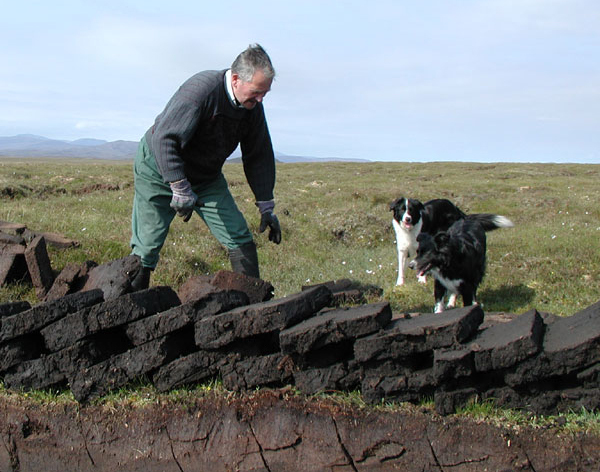 Peat is harvested from bogs and was traditionally used as a source of fuel. Today it’s burned in kilns to dry out the malted barley, which helps give scotch whiskey its unique flavor. After fermentation is complete, the mash is distilled and finally pumped into wooden casks for aging. After 3 years, you’ve got yourself a single malt scotch whiskey. In the end each batch of whiskey is a unique product of its maker and environment, with a distinct style all its own. No two distilleries will ever produce the same single malt and that’s part of the mystique and allure of the spirit. Like their blended cousins, higher quality single malts are often aged longer than the 3 year required by law. As the whiskey ages in the barrel, its tastes and aromas evolve. The whiskey also becomes more mellow and smoother with time. Usually you’ll see scotch sold as 10, 12, 16, or 18 year old, with the price increasing accordingly. It’s also possible to find even older examples such as 20, 30, or even 60 year old single malt, although they’ll cost as much as a car payment, or sometimes even the entire car! The Highlands: Basically all of northern Scotland, this is the largest production region. 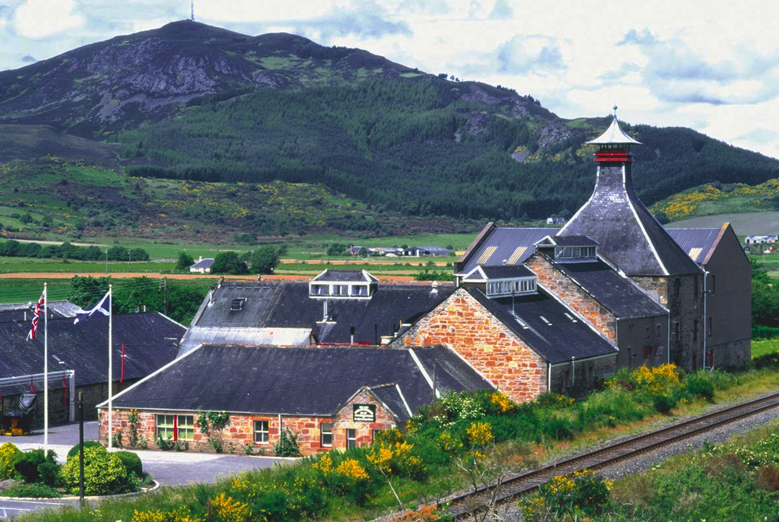 Most of the distilleries are located in a sub-region called Speyside (for its proximity to the Spey river). General characteristics of highland single malts are rich flavors, smokiness, and a touch of sweetness. Think of them as medium body whiskeys. The Lowlands: Mainly known for the grain whiskey distilleries used in blended scotch, but there are a few single malt distilleries here as well. They’re known for a much lighter style scotch, both in terms of flavor and color. They sometimes have a sweet scent and fruity characteristics. Think of them as light bodied whiskeys. Islay: The smallest of all Scotch regions, Islay is an island off the western coast of Scotland. It’s known for its heavily, full bodied style whiskeys. They often have an intense peaty flavor and seaweed or brine-like aromas. 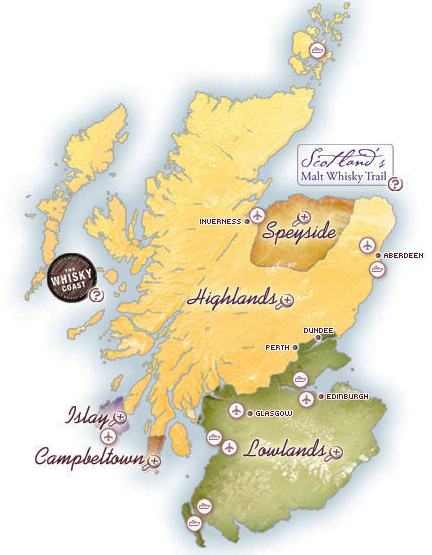 Map of Scotland showing the three primary whiskey regions. Once you’ve decided on a style and got a bottle picked out, it’s time to drink. This may seem like the easy part, but be warned that some people take their scotch very seriously and drinking it the wrong way can be a major faux pas. The general rule is that the better (more expensive) the scotch, the less acceptable it is to alter the flavor with additional ingredients. So, for example, while it’s perfectly OK to add a splash of Coke to a cheap blended scotch, you might get punched in the face for doing the same to a fine 30 year old single malt. For some, the only acceptable preparation for really good scotch is neat, but you can generally get away with “on the rocks” in most situations. Save the water and other mixers for blended whiskeys. Neat typically means at room temp. 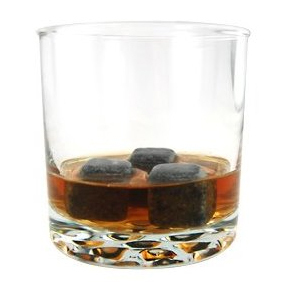 But for those who want a little chill without diluting their whiskey, scotch rocks are available. Cool them in your freezer and use in place of ice. Some people take their tasting very seriously, but for the beginner there are just a few characteristics you should be looking for. First is whether there are any obvious fruity or citrus characteristics which are products of the malted barely. A lot of the flavor will come from the barrel aging, which can contribute flavors such as vanilla, coffee, toffee, spice, or caramel. There will also probably be a peaty or smokey flavor from the kiln drying process. Finally, some aged scotches can take on tropical flavors such as coconut or banana. Armed with the above knowledge you’ve got everything you need to buy, drink, and hopefully appreciate scotch like a pro. And to that last point, one final word of warning; Scotch is definitely NOT something you want drink to get drunk. Don’t be mistaken, it’ll do the job and then some, but you’ll likely experience one of the worst hangovers of your life. Just remember that Scotch, like all things WASP’y, is best when kept classy. Enjoy! Head out and try some scotch for yourself. Be sure to spend a little extra and buy something worth trying, or you’ll surely be disappointed. A 12 year old single malt from a major distiller (Glenfiddich, Glenlivet, Macallen) is a good compromise between quality and price. Remember that scotch is an acquired taste that might take some getting used to. One way to ease yourself into it is by mixing in some water to dilute the taste. If you’re drinking a single malt, pour it over the rocks. For blended whiskey, I enjoy a splash of soda water thrown in as well. 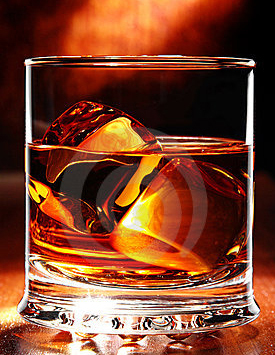 You may think of scotch as the quintessential man’s drink, and it is (Remember it was Bill Brasky’s spirit of choice)! However, most men will admit there’s something undeniably appealing about a girl who can appreciate a glass of good single malt. For ladies, knowing the basics of scotch can help make a powerful and lasting impression among the right company.